Turnbull and Morrison have lied about housing affordability and sold out first-home buyers to satisfy their Party's base and its big donors, writes managing editor David Donovan. FEW ISSUES so clearly demonstrate the way Australian politics is skewed away from the public interest, and towards partisan political concerns and vested interests, than the debate over housing affordability. Respected independent economists are in almost unanimous agreement about the primary reason why housing is becoming an unattainable dream for first home buyers in Australia’s capital cities: income tax concessions are making property speculation more lucrative than earning money by doing actual work. More specifically, negative gearing and capital gains tax (CGT) concessions have combined to stimulate massive demand in the property market in Australia, thereby driving up housing prices in many capital cities to absurd levels. There are other factors, of course, but it is mostly this that has created both a housing and a private debt bubble — both of which increasingly threaten the Australian economy. It was, it should be remembered, the collapse of the United States housing bubble that largely precipitated the Global Financial Crisis. The contortions and mental gymnastics the Federal Government have been prepared to go through to deny these obvious "Economics 101" conclusions have been interesting to watch, to say the least. Especially since, in 2005, Malcolm Turnbull had spoken out against negative gearing, labelling it and the CGT discount a "sheltering tax haven” and “tax avoidance”. “… skewing national investment away from wealth-creating pursuits, towards housing." Yet by the time this year’s Federal election was called, Turnbull had radically changed his tune. When the Labor Opposition proposed abolishing negative gearing for all but new housing stock, as well as halving the 50% capital gains tax concession for assets held longer than 12 months, there was no more adamant objector to be found anywhere than the prime minister. "... a sledgehammer through the residential property market." He was rightly mocked at the time for making these dire prognostications, none of which he could back up with anything apart from discredited modelling or, when really pressed, vague claims about them being “common sense”. Turnbull’s manic scattergun attacks on Labor’s modest reforms were supported, with even less plausibility, by Turnbull's seemingly economically illiterate treasurer, Scott Morrison. The Treasurer had also switched from claims made as recently as February that “there are excesses” in negative gearing and that it had gone too far. And it didn't end there, with the irrational attacks against negative gearing and CGT reform escalating even further following the July election. 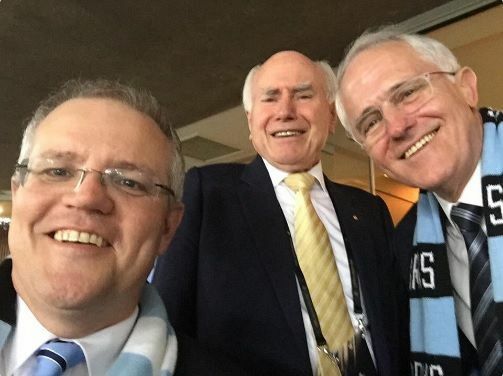 In August, it was revealed that, earlier in the year, Turnbull and Morrison had both, in line with their earlier positions, advocated reforming negative gearing and CGT concessions, but had been rolled by the conservative “Monkey Pod” wing of the Party. In other words, Turnbull and Morrison have been making specious arguments they don’t even believe themselves to pursue a partisan political objective. A partisan objective, moreover, that clearly benefits the Liberal Party's predominately affluent baby boomer base. This hasn’t chastened the terminally unpopular Turnbull, though, who has begun making some truly bizarre arguments. Such as last week, as he spoke in Parliament on the passage of the latest ABCC bill, Turnbull theatrically tried to blame high house prices on “union thuggery” and the CFMEU, despite the union having almost no representation on small building projects. Turnbull upped the ante again this week, trying yet another tack, this time linking unaffordable housing to environmental activism. Seriously. It's not too hard to work out which two party political foes Turnbull was trying to damage when he made these two opportunistic and illogical claims. Of course, keeping negative gains and CGT concessions high also benefits some of the Liberal Party’s key financial backers. Which may explain why Scott Morrison this week added yet another ingredient into the Coalition's overflowing housing affordability witch's brew. SCOTT MORRISON has suddenly announced that he cares about housing affordability. This is interesting given his strident opposition to getting rid of negative gearing and the concessional treatment of capital gains; two Federal Government policy settings that are broadly agreed to be major contributors to Melbourne and Sydney’s out of control house prices. What’s Morrison’s solution? To encourage state governments to increase the supply of housing by loosening planning restrictions and releasing more land for development. Given his opposition to the Federal Government using its very powerful levers to improve housing affordability, why is Scott Morrison now so keen for state governments to act? This "idea" to release more land and loosen planning regulations for new developments looks like a direct quote from developers. Amazing, isn’t it? Ten days after the Property Council comes out calling for planning reform Scott Morrison suddenly takes an interest in housing affordability and his solution: planning reform. Smell a rat anyone? According to the most recent data we have, the real estate sector gave the Liberal Party over $1.8 million in donations in 2015 alone — and that wasn’t even an election year. Big development companies are constantly lobbying for more land releases on the urban fringes of major cities. This is unsurprising given the profits to be made from such releases. Of course, there are plenty of empty houses closer to the centre of town, but that doesn't help developers. This "supply problem" argument makes little sense when so many of Melbourne and Sydney’s houses lie vacant due to the distorted investment environment created by Federal Government policy. Last year, clever water use analysis by Prosper Australia found that almost five per cent of Melbourne’s housing stock was unoccupied — or nearly twenty per cent of investor owned properties. These numbers are far higher than the official vacancy rates. Before we rush to build more houses, we should get people living in all the houses that already exist. Of course, property developers are just one of the many vested interests benefiting from what I called, in a previous article, the ‘Government run Australian property market Ponzi scheme’. Others include state governments, insurance companies and banks. Banks, in particular, gain through the more rapid growth of their loan book from sharply increasing house prices. It is no coincidence that the Coalition are desperate to avoid a royal commission into the banks who, of course, are also very major donors to the Liberal Party. In summary, the Turnbull Government does not care about housing affordability or first home buyers. On the contrary, their backers and their base want house prices to continue to steeple. Sadly, Turnbull and Morrison are quite content to make absurd and conflicting claims – and openly lie – to allow this to continue. First home buyers are neither a major part of the Liberal Party base nor politically powerful enough to extract anything more than crocodile tears from the politically weak pair presently nominally in charge of our economy. Meanwhile, the property and the private debt bubble continues to expand — putting in grave danger all our financial futures. You can follow Dave Donovan on Twitter @davrosz. Brilliant investigative finance journalist Michael West spoke to Dave last week in the latest exclusive IA podcast about the Government, housing affordability and the banks. Listen to this podcast in the members’ only area by clicking on the image below. If you are a subscriber and can't login, email us HERE. Get more! Subscribe to IA for just $5 HERE!